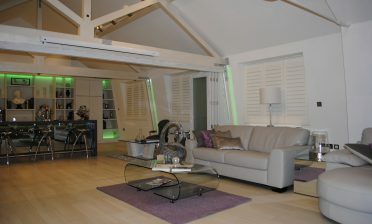 We were contacted by a client in Beckenham, Kent looking to add the finishing touches to their luxury master en-suite. The property was a semi-detached home down a busy road of Beckenham, which made privacy a crucial part of this bathroom installation. Working with the look of the clients bathroom and taking into account the homes sash windows, we came up with these full height shutters complete with mid rail to compliment the lines of the windows. 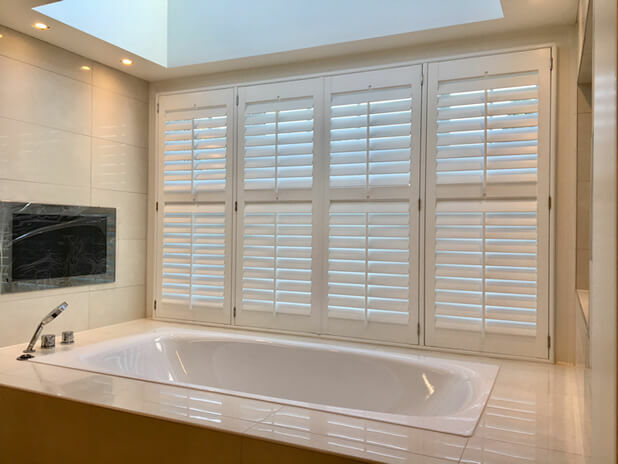 The shutters were created from our PVC range due to the positioning of the shutters next to the bath where the panels and louvres may come into contact with moisture and water, especially if the client is adjusting the shutters while in the bath. 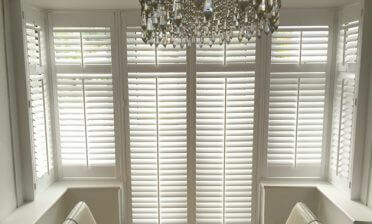 Using a mid rail in the design the homeowners are able to get maximum adjustment out of both the top and bottom of the shutters, allowing for example the bottom half to be kept fully closed with the tops open for light to stream into the en-suite. We created the panels using 89mm louvres and centralised tilt rods which makes for a traditional, luxury look acting as a fully functional centre piece for the bathroom. With a TV located next to the bath the customer can quickly and easily adjust the shutter louvres to allow for the right ambiance when soaking in the bath and watching the screen. The shutters were finished in pure white with stainless steel hinges which we use for installations in bathrooms and wet rooms. 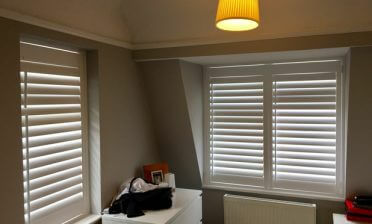 Tom carried out this flawless installation which added the final touches to this fantastic master en-suite and left a very happy client to enjoy their new shutters for years to come!